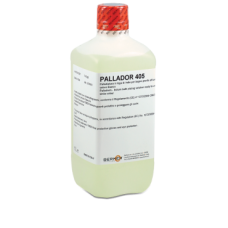 PALLADOR 102 WHITE FLASH SOLUTION BATHPALLADOR 102 is a ready-to-use palladium process specifically designed for flash deposits. 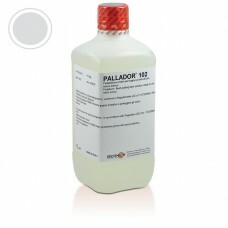 The PALLADOR 102 process is characterized by the remarkable compactness and resistance of the galvanic layer, which make it particularly suitable as a pre-rhodium and a..
PALLADOR 205 WHITE THICKNESS SOLUTION BATHPALLADOR 205 is a ready-to-use palladium process specifically designed for thick deposits. 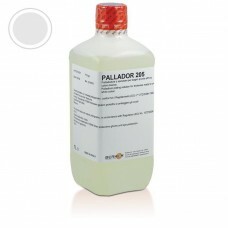 The PALLADOR 205 process is characterized by the remarkable compactness and resistance of the galvanic layer, which make it suitable both as a pre-rhodium and as an..
PALLADOR 305 WHITE NICKEL ALLOY SOLUTION BATHPALLADOR 305 is an extremely hard compact palladium-nickel galvanic bath that can be used as a white flash or thickness finish. 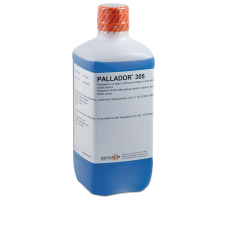 PALLADOR 305 is formulated to deposit a Pd-Ni (80 % - 20 %) alloy which can be modified to prevent the release of nickel in ..
PALLADOR 405 WHITE INDIUM ALLOY SOLUTION BATHPALLADOR 405 is a palladium-indium galvanic bath which is extremely compact and resistant to oxidisation and can be used as a white flash or thickness finish. PALLADOR 405 deposits a Pd-In (90%-10%) alloy which is completely anallergic and free from to..
PLATINOR 104 WHITE PLATINUM SOLUTION BATHPLATINOR 104 is a pure platinum plating which can be used either as a thickness or flash process for white finishes. It is extremely easy to use and comes complete with all replenishers for correct maintenance of the solution.General characteristics ..